Free RV Winterization Class: Register Today! There is still plenty of time to enjoy fun camping getaways with indian summer weather and changing fall colors, however it’s also time to start thinking about storing your RV for the winter. Join Us At Wilkin’s RV locations in Bath, Churchville or Victor for a free, fun and informative 90 minute RV winterization seminar. Don’t let freezing weather catch you off guard! Be ready for freezing temps and avoid costly damage to your coach. RV Winterization classes will take place on September 29th at our Victor, NY location and October 7th at our Bath, NY and Churchville, NY Dealership locations. 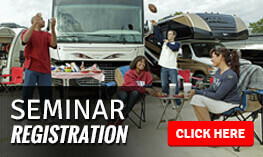 Registering for our RV winterization classes is easy. Fill out this online form or call us at 800-724-2105 to reserve your spot for this free class! But don’t wait, registration is required and space fills up fast. Save money and time by winterizing your RV yourself. We’ll show you how for free! Whether you own a driveable or towable RV big or small, it’s important to prepare your RV properly for successful storage throughout the cold winter months. Nothing beats hands on experience when learning new maintenance tips for your RV. Our RV technician specialists will share their many years of experience in this comprehensive free seminar. We have RV seminars all though out the year, Check back for future classes for more tips and tricks to get the most out of your RV. For more information, Contact Us at Wilkins RV. Whether you are a beginning or experienced RVer, this is your chance to learn something new!